We finally had two great days in a row on the water. The R/V Nereid went out the 20th and 21st and our other vessel, the R/V Callisto, also went out on the 20th. The result of this effort was a fairly comprehensive picture of right whales in the Bay of Fundy. They are spread out over a very large area with at least two different aggregations--one to the northeast and another to the southwest. Yesterday, we started the day with a small SAG off Swallowtail Light House within a stones throw of Grand Manan Island. With such good coverage, we learned that there has been an influx of quite a few new animals into the Bay and many of them are big, adult males. These animals seem frequently to be on the edges of the distribution, often performing acoustic displays known as gunshots--loud, percussive underwater sounds. 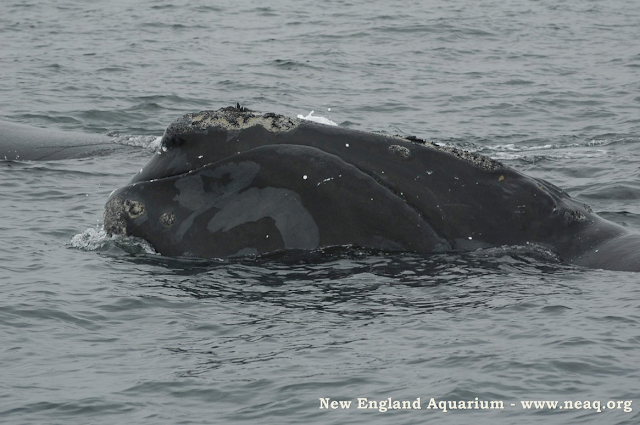 Towards the end of the day yesterday, we had several old males exhibiting typical gunshot behavior (lifting their heads out of the water and then pushing them down forcefully) way to the south in the middle of the outbound shipping lane. One of them was "Starry Night," an old favorite that we have been watching since 1980. We don't know why animals segregate in the Bay, but that doesn't keep us from having fun speculating. For example, why would adult males stay on the fringes? Are they setting up acoustic territories advertising to females with the gunshot sound (Here's a little more about right whale acoustics)? 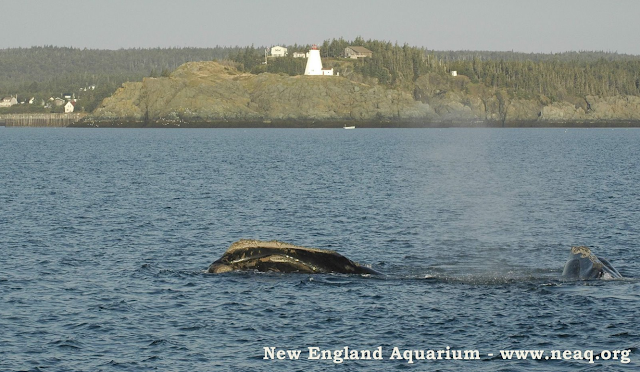 Since many of the big males were on the southern edge of the distribution, someone joked that they are serving as the "gate keepers" to the Bay of Fundy. That joke got me thinking--could that be possible? Nothing described about this species' social structure would indicate that they coordinate in such a way, and yet there is much we don't know about these animals. Could they patrol the edges of the right whale distribution forming a protective perimeter like male musk ox in a circle with the females and young in the middle? What would they be protecting them from? Killer whales are their only possible predators and they are relatively rare in these waters. I include this wild speculation to show the fun part of science--exploring ideas. If we found any evidence of this behavior in other similar species, then we could formulate a formal hypothesis and then test it with the appropriate data. The small yet exciting steps of science.